Convert existing forklifts to an OSHA-compliant elevated platform for personnel with Picking Work Platforms (PWP) from BHS. 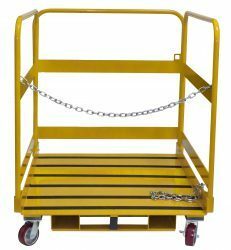 These safe and dependable Work Platforms provide access to top rows of shelving for order picking, stock putaway, inventory, changing light bulbs, and other overhead tasks associated with warehousing and material handling. The PWP is designed for safety first. The deck features an anti-skid surface with toe guards to keep tools from falling. Tall steel barriers keep users safely within the unit, and a hook-and-chain mast restraint provides another layer of protection. Integrated fork pockets keep Picking Work Platforms securely attached to lift trucks. For even more flexible positioning, choose optional casters that allow the unit to be rolled into place. Two locking swivel casters and two rigid poly casters make the unit easy to maneuver for use or storage. To purchase a Picking Work Platform, find your local BHS dealer by calling 1.800.BHS.9500.